Mostly all iOS devices users know about the MOV format because it is used to play videos on iOS devices and Mac OS. This format is very good in quality, but not all of the video players can support this file type. If you have most of the files in the MOV format and looking to play them on Windows operating system, then you can convert MOV to MP4 files because MP4 is widely supported by almost all the video players. In this article, you’re able to learn about the helpful online and desktop video converters that can help you to convert MOV to MP4 files. 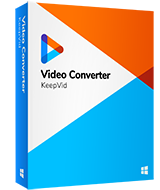 KeepVid Video Converter is a desktop program to convert video and audio files, and besides converting MOV to MP4, this video converter also supports to convert videos to more than 1000 video and audio formats. In addition, the program allows you to divide the video into smaller clips as well as add subtitles and video effects such as image rotation or reflection. In this part, we are going to introduce the key features of KeepVid Video Converter and how to use it to convert MOV to MP4. Allow you to convert videos to more than 1000 video and audio formats. Convert videos with high-speed conversion feature. Step 1. Start KeepVid Video Converter and add the MOV file into the program. Step 2. Select MP4 as the output format, and click the Convert button to start converting MOV to MP4. Step 3. When the conversion finishes, you can go to the Converted tab to find the converted video. Download and install KeepVid Video Converter on your computer, then start it. 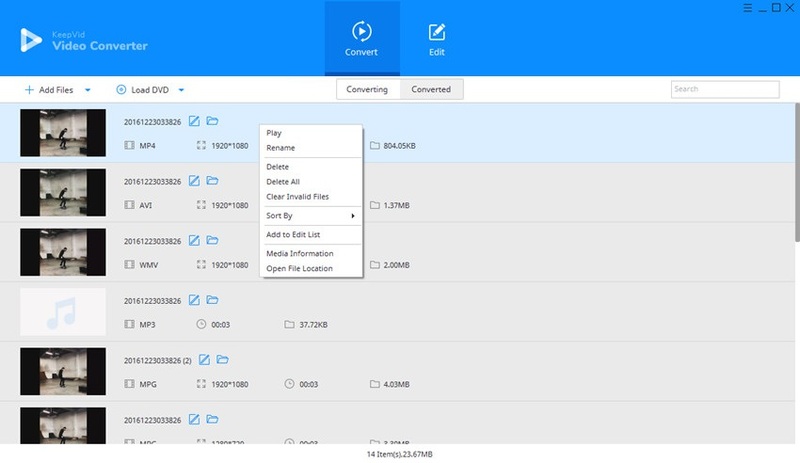 Now choose the Convert section and click the Add File or Add Folder button at the upper left corner of the main interface to add the MOV file from your computer to the program. You’re also allowed to drag and drop the file into the program window. 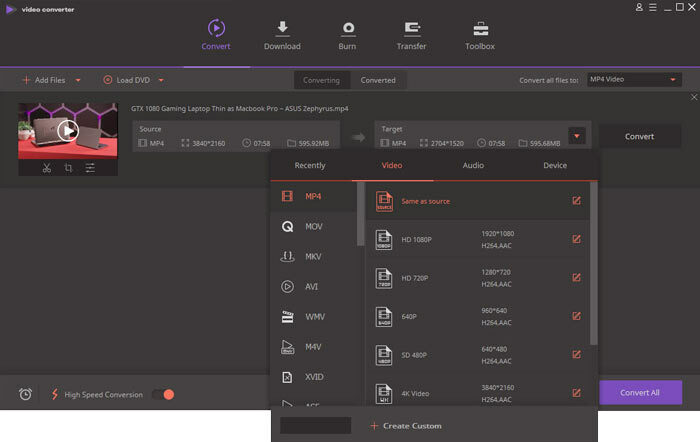 KeepVid Video Converter will show you the detailed information of the file. Now you can click the inverted triangle at the right side of the Target area, and select MP4 as output format in the pop-up dialog. Or you can click the inverted triangle at the right side of the Convert all files to button, and select MP4 as an output in the pop-up window. After that, click the Convert or Convert All button to start converting MOV to MP4. Now the converter will start conversion immediately, and it will show you the process of the conversion. When the conversion finishes, you’ll get the file in the Converted tab. You’re also allowed to right-click the converted file and choose Open File Location to find the converted video in your computer. Converting MP4 to MOV is also an easy task to be done with KeepVid Video Converter. The program can help you to finish the task in very short time. • Video conversion process compresses the files or expending files size according to the output format. • Before conversion, you can use the editing feature of the program to customize your video. • It’s better to use an all-in-one video converter so that you can save a lot of time. We're going to introduce the top online and desktop video converters for you to convert MOV to MP4. These converters will help you to convert the work done easily. KeepVid Online Video Converter is also helpful to convert MOV to MP4 online without installing any third-party software. 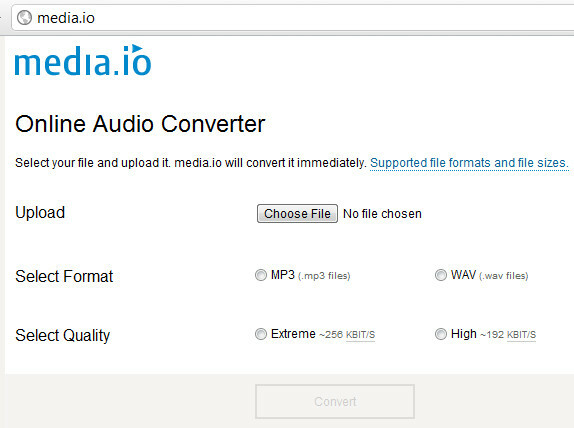 This converter website works online and enables you to convert MOV to MP4 with your Internet browsers, such as Chrome, Firefox, Internet Explorer, etc. This online site does not only convert MOV to MP4 online, but also convert videos to more than 50 formats easily. Wondershare Video Converter Ultimate is perfect video converter software for Windows and Mac users. This converter has very powerful features than the online video converters. You can quickly convert, edit, download, transfer or burn videos to DVD with this converter program. 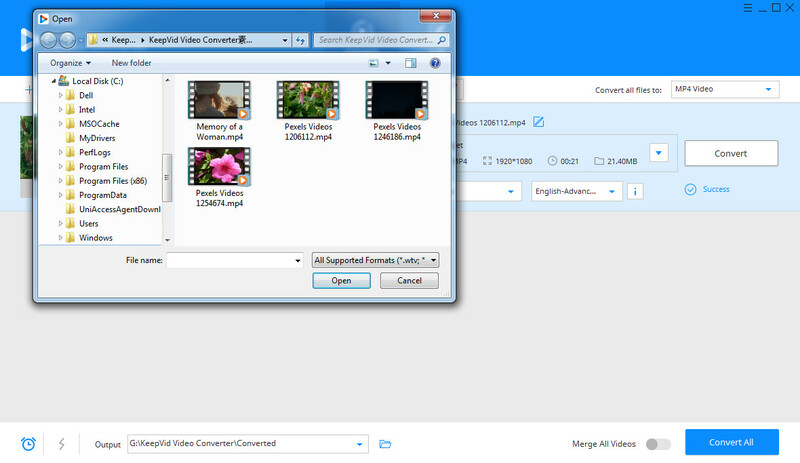 Wondershare Video Converter Ultimate can be regarded as a complete video toolbox. This is an easy-to-use video converter website which can help you to convert MOV to MP4 online without any installation. Just like KeepVid Online Video Converter, with this online video converter website, you only need to upload the videos and select the file you need for output, then convert it. This website will convert the file online and provide you a download link once conversion is finished.